IDE involving language editors, ST compiler, translators of FBD, LD and SFC graphical languages, online execution mode, and debugger. Simulator CPSim for execution monitoring, built from buttons, “LEDs”, control panels, value displays, and simple trends. Platform dependent CPCon configurer for interfacing communications and I/Os, custom developed while porting CPDev to particular target platform. CPVis tool for designing HMI interfaces. Displays may be presented by different devices, such as TFT and LCD panels, monitors. Virtual machine runtime for execution of intermediate VMASM code (Virtual Machine Assembler) generated by the compiler. Visualization runtime for CPVis. Runs in parallel with the VM. Runtime environment composed of several VMs (execution units) for complex software. The software consists of corresponding CPDev projects. Data exchanged by means of global variables. May be used as a supervisory computer for PLCs, PACs and HMI panels, or as a station in DCS system. Implemented as a service in Windows service functionality. Runs nonstop in the background, and starts automatically when the computer is switched on. 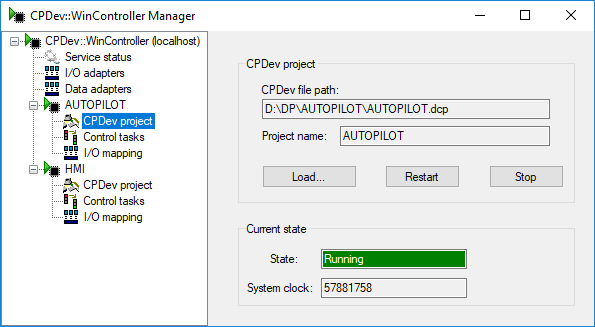 Dedicated runtime for execution of single CPDev project by PC. External devices connected by USB. Modbus TCP protocol for SCADA software. Simple OPC server.